These ladies in my library are an enchanting lot. 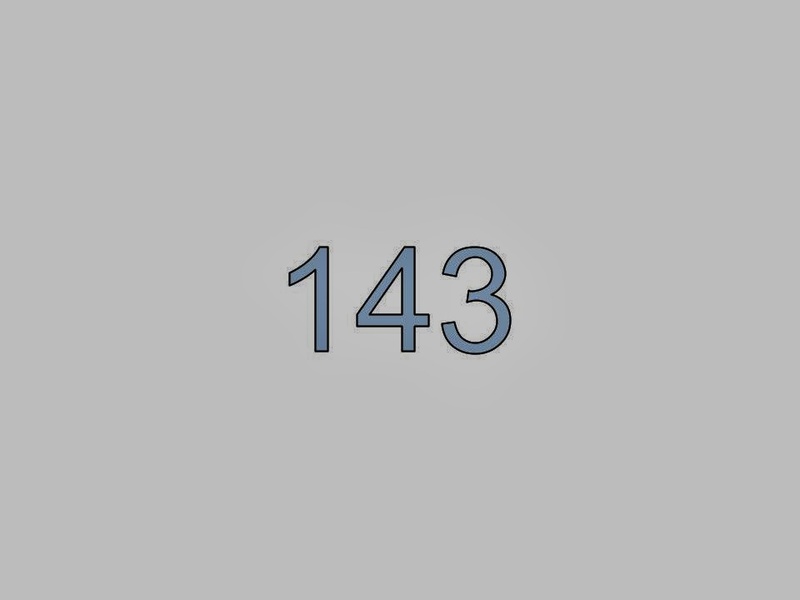 There is not a one I would not like to have known. In 1966, Ellen Shaffer, Rare Book Librarian of the Free Library of Philadelphia, became the first women to hold the office of President of the Manuscript Society. And she invited her long-time friend, the distinguished book collector, Norman H. Strouse, to deliver the talk at the society's annual meeting. "Ladies in My Library" was the title of his talk. "Ladies in My Library" was also the title of the talk that Norman Strouse gave at the meeting of the Philobiblon Club on November 21, 1967: "An Evening in Honor of Miss Mabel Zahn," the renowned bookseller of Sessler's Bookstore in Philadelphia. 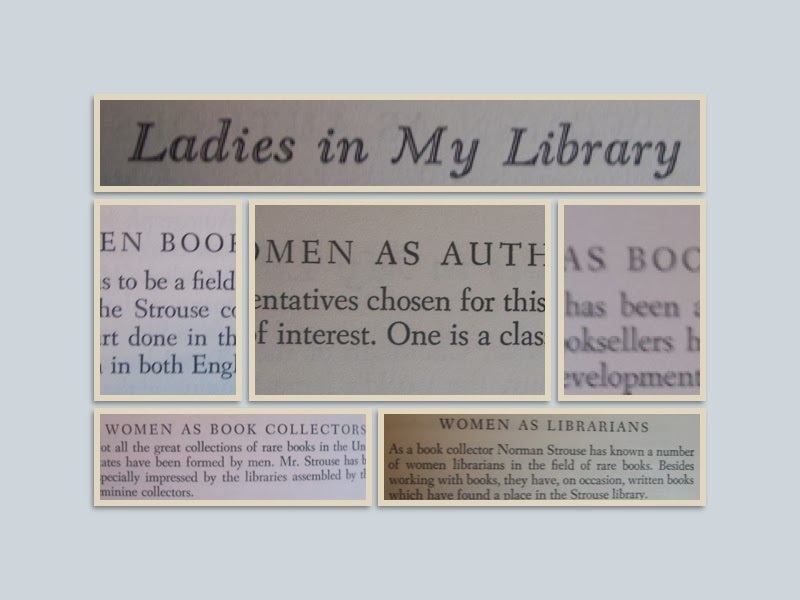 And the following year, from September 3rd to November 17th, the Free Library of Philadelphia held an exhibition by the same title: Ladies in My Library: Books and Letters From the Collection of Norman H. Strouse. In my library, I have the typescript of Norman Strouse's talk before the Manuscript Society, which I recently acquired from Oak Knoll Books. And I have two copies of the catalog of the exhibition at the Free Library of Philadelphia. The cataloger of the exhibition suggested that other collectors might "enjoy making a census of their feminine representatives and comparing them with those of Mr. Strouse." While I enjoyed making a census of ladies in my library, my motley collection of books and letters is no match for the admirable display of fine bindings, not to mention letters literally from First Ladies, in Mr. Strouse's library. But surprisingly, there are four ladies in my library who were ladies in Norman Strouse's library! 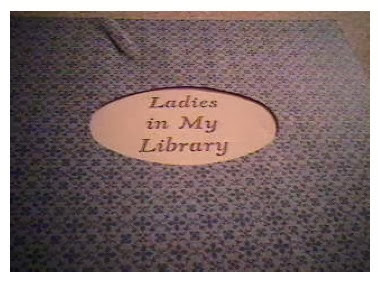 NOTE: Many of the ladies in my library made names for themselves in more than one field. But for simplicity's sake, I will only list them in one category. Estelle Doheny (1875-1958) is one of the ladies in my library. And she was one of the ladies in Norman Strouse's library. 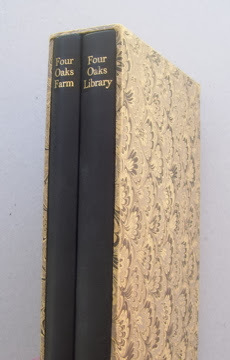 She gave a portion of her library to St. Mary's Seminary in 1954, which included two copies of Trees and Other Poems. These copies were part of lot number 371 of the Christie's Sale of the Estelle Doheny Collection held on Dec. 14, 2001. 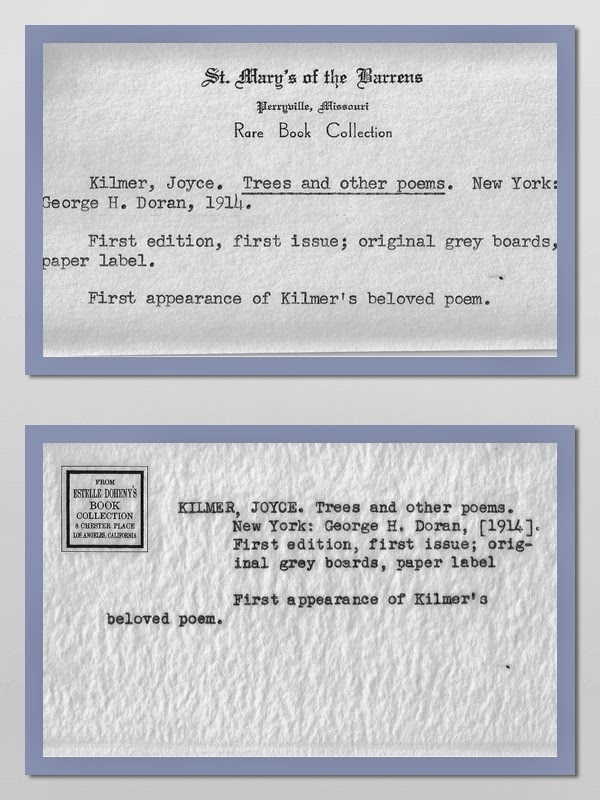 The statement on the listings below: "First appearance of Kilmer's beloved poem," is incorrect. The poem first appeared in the August 1913 issue of Poetry: A Magazine of Verse. Mary Hyde (1912-2003) is one of the ladies in my library. And she was one of the ladies in Norman Strouse's library. 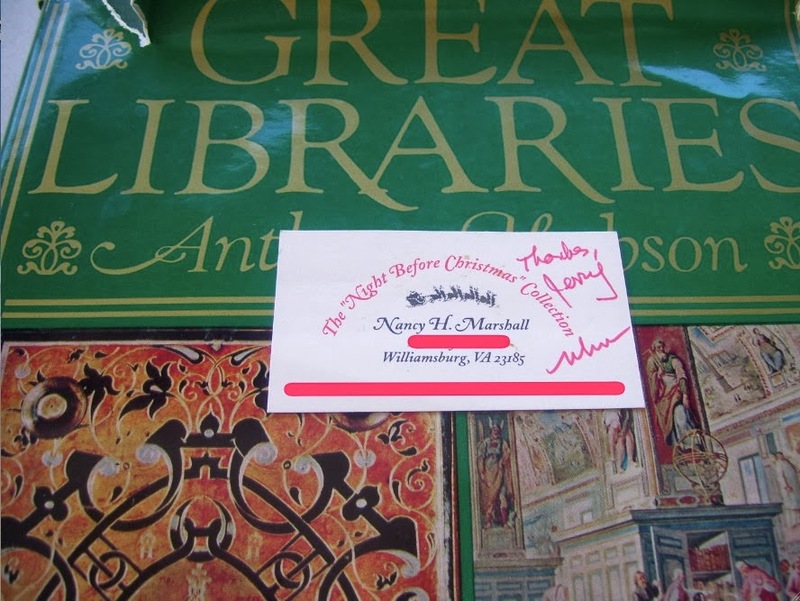 Norman Strouse called her "The First Lady of Books" because of her Boswell-Johnson collection at the Four Oaks Library. And in 1984 Mary Hyde became a lady of nobility, "Lady Eccles," when she married David, Viscount Eccles. Mrs. Piozzi (1741-1821), also known as Hester Lynch Thrale, is one of the ladies in my library. I have a copy of the catalogue of her library, her anecdotes in Johnsoniana, and the books that Mary Hyde wrote about her. I have yet to read the marginal comments she wrote in Boswell's Life of Johnson but am looking forward to reading them when I'm old and grey. . . .
Alida Roochvarg (1922-1993) is one of the ladies in my library. She collected books about books for almost forty years (my area of expertise), and then decided that "the time had come to think of sending the collection out into the world." The author and collector, Herman Abromson, claimed Alida Roochvarg as his mentor when both were members of the Long Island Book Collectors. And in the forward to the catalogue of her library, he wrote, "Through her collection, you glimpse a great book lady." Maureen E. Mulvihill, scholar and writer, Princeton Research Forum, is one of the ladies in my library. At a Florida Bibliophile Society meeting in October 2011, I had the pleasure of viewing some of her rare books and listening to her presentation, "The Evolution and Education of a Collector (1980s-): The Mulvihill Collection of Rare and Special Books and Images." Asta Beckett is one of the ladies in my library, and I am "honoured" to have her in my library. Asta not only collects fine leather books, she makes a living by cleaning, reconditioning, and then selling them to other booklovers. Here are some of her recent reconditioned bindings. Norman Strouse would have loved them. Lydia M. Poirier (1873-1936) is one of the ladies in my library. She was the librarian at the Duluth Public Library in the early 1900s and collected bookplates. 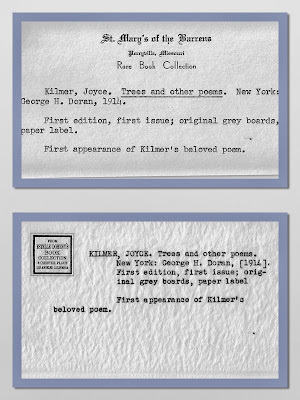 She traded bookplates and corresponded with other bookplate collectors, including Wilber Macy Stone. I have nine of her letters in my autograph collection. Ellen Shaffer (1904-1994) is one of the ladies in my library. And she was one of the ladies in Norman Strouse's library as well. She knew Norman Strouse for sixty years, from when she worked at Dawson's bookstore, when she was Rare Book Librarian at the Free Library of Philadelphia, and when she was Strouse's librarian at the Silverado Museum, a museum devoted to Robert Louis Stevenson. The two letters from Ellen Shaffer displayed above were to the book collector, J. C. Dykes, whom she recognized from her days at Dawson's. And the presentation to her displayed below is from Mike Harrison, written on her copy of Harrison's book, How to Build a Poor Man's Library. Ironically, one of Norman Strouse's books was titled How to Build a Poor Man's Morgan Library. Centered on the book above is Nancy Marshall's business card which she included with a batch of prints of the Koran, a fourth century Greek Bible, royal portraits, and manuscripts and first editions. Her note on the reverse side of the card explains the prints: "Jerry--I had these from an exhibit I did many years ago--perhaps they will be of interest to you". ...like I said...."a great lady" ....and in My Library! Faith Legg is one of the ladies in my library. She was the proprietor of The Guildhall Bookroom when I first started collecting books in the late 1980s while stationed in England. I thought of her when I recently read Joel Silver's article in the Winter 2014 issue of Fine Books & Collections: "Collector and Bookseller: A Vanishing Relationship?" Faith Legg was my first mentor in the pleasures of book collecting. And she taught me well. 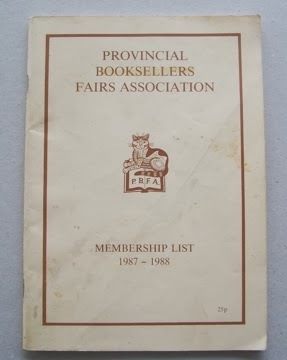 When I had depleted her stock of books that were to my liking, she gave me copies of the PBFA membership list so I could find books in other bookstores around the English countryside. Karen Thomson is one of the ladies in my library. 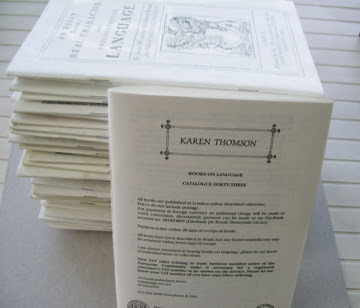 I never met her, but I received five of her exquisite catalogs of books on language while stationed in England in the late 1980s. And I acquired another sixty of her catalogs in 2012. 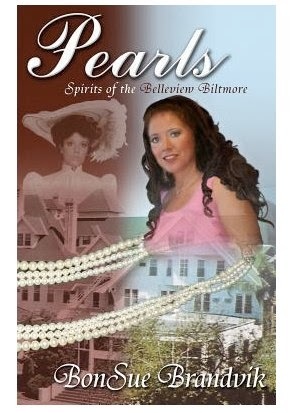 You can view the covers of over twenty of her catalogs in one of my blog posts from last year. Leona Rostenberg (1908-2005) and Madeleine Stern (1912-2007) are ladies in my library. 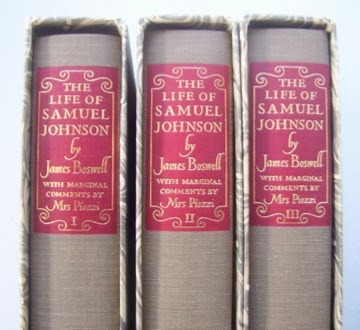 And I have enjoyed reading their adventures in finding, buying, and selling rare books. They too are dually qualified in "Women as Booksellers" and "Women as Authors." Sheila Markham is one of the ladies in my library. She also qualifies in both "Women as Booksellers" and "Women as Authors. Her interviews of other booksellers first appeared in the Bookdealer in 1991. 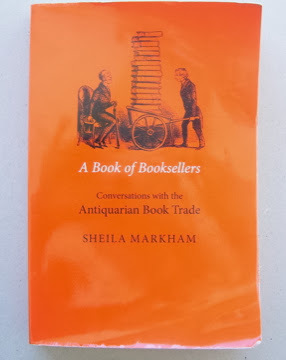 Her Book of Booksellers: Conversations With the Antiquarian Book Trade was first published in hardback in 2003, and in my well-read softcover copy in 2007. 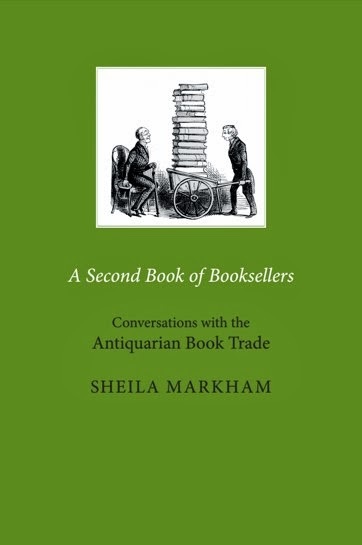 A Second Book of Booksellers: Conversations With the Antiquarian Book Trade. Mary Benjamin (1905-1998) is one of the ladies in my library. And she was one of the ladies in Norman Strouse's library. Mary Benjamin was known as "The Autograph Lady." I have 60 issues of The Collector dating back to 1887 when her father, Walter R. Benjamin, first started his autograph business. The earliest issue I have with his daughter, Mary Benjamin, as part of the company is 1926. She took over the running of the company in the 1940s and ran it for another 50 years. Yes. Mary Benjamin earned her title as "The Autograph Lady." Edith Diehl (1876-1953) is one of the ladies in my library. And she was one of the ladies in Norman Strouse's library. Nine of the ladies in Norman Strouse's library were bookbinders, including his wife. And of the 82 items listed in the exhibition catalog, 32 of them were fine bindings. 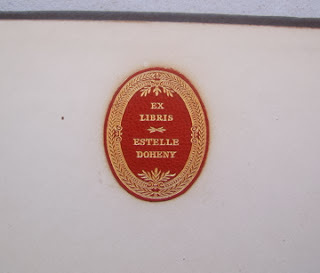 I have one binding by Edith Diehl from her own library, a relatively plain binding displayed below. Norman Strouse had a binding from her own library as well. L. Averill Cole (1880-1971) is one of the ladies in my library. I'm surprised she wasn't included in the Strouse exhibition because she was one of the premiere binders of her day. The image above shows parts of a letter to the book collector, William F. Gable, thanking him for a vase he gave her, and discussing a book she was binding. She signs the letter "L. Averill Howland," but mentions that "L. Averill Cole" is still her professional name. Virginia Woolf (1882-1941) is one of the ladies in my library. While not purposely collecting her, ten book by and about her now sit on the shelves in my library. Anne Fadiman is one of the ladies in my library. And yes, I purposely acquired the books she has written. I even have the last issue she edited of The American Scholar. Agnes Repplier (1855-1950) is one of the ladies in my library. I have ten of her books of essays in my library, and have enjoyed reading every one of them. I also have an autograph letter she wrote to the author, Margaret Sutton Hopkins, who wrote under her maiden name, Margaret Sutton Briscoe. Catherine Dille is one of the ladies in my library. If you ever have a question about George Birkbeck Hill (and I had a few), then Catherine Dille is your woman! BonSue Brandvik is one of the ladies in my library. And she is my youngest son's mother-in-law. My wife enjoyed reading her book, and can't wait for the second one. Susan F. Rosen is one of the ladies in my library. She was the editor of Other People's Books: Association Copies and the Stories They Tell, The Caxton Club, 2011. There were 52 stories in all. Can you imagine editing essays from 52 authors for one book? No easy task! I was one of the authors, and my essay went through several revisions. Linda Morris is the love of my life. She loves reading. She loves football. She loves baseball. And she loves me. I am blessed. And do I know it!